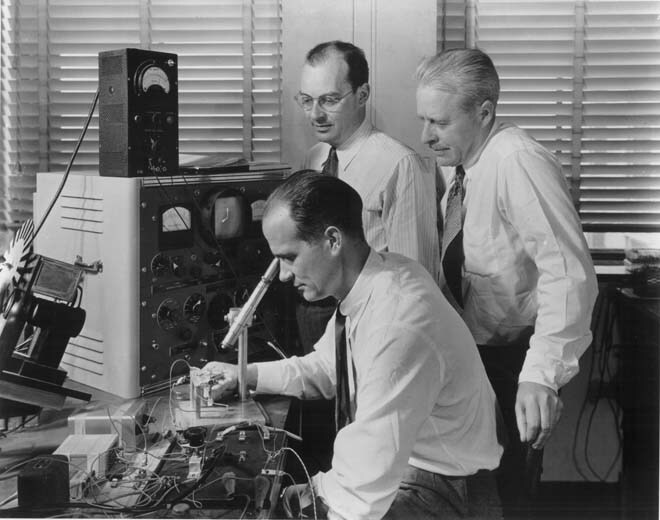 During its fifty odd years of existence, Bell Labs was the most productive scientific laboratory on the planet. It won seven Nobel Prizes, contributed innumerable practical ideas underlying our modern way of life and, whether by accident or design, also managed to make some spectacular basic scientific discoveries that expanded our understanding of the universe. How did it possibly accomplish all this? In this authoritative and intensely engaging book, Jon Gertner tells us exactly how. Gertner's book about this great American institution excels in three ways. Firstly, it describes in detail the genesis of what was then an unlikely research institution. Until then most communications related work was considered to be squarely within the domain of engineering. Bell Labs arose from a need to improve communications technology pioneered by its parent organization AT&T. But the real stroke of genius was to realize the value that basic scientists - mainly physicists and chemists - could bring to this endeavor along with engineers. This was largely the vision of two men - Frank Jewett and Mervin Kelly. Jewett who was the first president of Bell Labs had the foresight to recruit promising young physicists who were proteges of his friend Robert Millikan, a Nobel Prize winning physicist and president of Caltech. Kelly in turn was Millikan's student and was probably the most important person in the history of the laboratory. It was Kelly who hired the first brilliant breed of physicists and engineers including William Shockley, Walter Brittain, Jim Fisk and Charles Townes and who would set the agenda for future famous discoveries. During World War II Bell gained a reputation for taking on challenging military projects like radar; at the end of the war it handled almost a thousand of these. The war made the benefits of supporting basic science clear. It was Kelly again who realized that the future of innovation lay in electronics. To this end he moved Bell from its initial location in New York City to an expansive wooded field in New Jersey near Murray Hill and recruited even more brilliant physicists, chemists and engineers. This added further fuel to the fire of innovation started in the 1930s, and from then on the laboratory never looked back. Secondly, Gertner gives a terrific account of the people who populated the buildings in Murray Hill and their discoveries which immortalized the laboratory. Kelly instituted a policy of hiring only the best minds, and it did not matter whether these were drawn from industry, academia or the government. In some cases he would go to great lengths to snare a particularly valuable scientist, offering lucrative financial incentives along with unprecedented freedom to explore ideas. This led to a string of extraordinary discoveries which Gertner describes in rich and accessible detail. One feature of the book that stands out is Gertner's efforts in describing the actual science instead of skimming over it; for instance he pays due attention to the revolution in materials chemistry that was necessary for designing semiconductor devices. The sheer number of important things Bell scientists discovered or invented beggars belief; even a limited but diverse sampling includes the first transatlantic cable, transistors, UNIX, C++, photovoltaic cells, error-corrected communication, charged-coupled devices and statistical process control that now forms the basis of the six-sigma movement. The scientists were a fascinating, diverse lot and Gertner brings a novelist's eye in describing them. There was Bill Shockley, the undoubtedly brilliant, troubled, irascible physicist whose sin of competing against his subordinates led to his alienation at the lab. Gertner provides a fast-paced account of those heady days in 1947 when John Bardeen, Brittain and Shockley invented the transistor, the truly world-changing invention that is Bell Labs's greatest claim to fame. Then there was Claude Shannon, the quiet, eccentric genius who rode his unicycle around the halls and invented information theory which essentially underlies the entire modern digital world. Described also are Arno Penzias and Robert Wilson, whose work with an antenna that was part of the first communications satellite - also built by Bell - led to momentous evidence supporting the Big Bang. 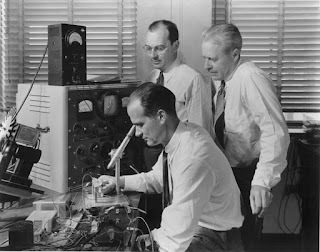 The influence of the laboratory was so formative that even the people who left Bell Labs later went on to greatness; several of these such as John Bardeen and future energy secretary Steven Chu joined elite academic institutions and won Nobel Prizes. It's quite clear that the cast of characters that passed through the institution will probably never again be concentrated in one place. But perhaps the most valuable part of the book deals not with the great scientific personalities or their discoveries but with the reasons that made Bell tick. When Kelly moved the lab to Murray Hill, he designed its physical space in ways that would have deep repercussions for productive thought and invention. Most crucially, he interspersed the basic and applied scientists together without any separation. That way even the purest of mathematicians was forced to interact with and learn from the most hands-on engineer. This led to an exceptional cross-fertilization of ideas, an early precursor of what we call multidisciplinary research. Labs and offices were divided by soundproof steel partitions that could be moved to expand and rearrange working spaces. The labs were all lined along a very long, seven-hundred foot corridor where everybody worked with their doors open. This physical layout ensured that when a scientist or engineer walked to the cafeteria, he or she would "pick up ideas like a magnet picks up iron filings". Other rules only fed the idea factory. For instance you were not supposed to turn away a subordinate if he came to ask you for advice. This led to the greenest of recruits learning at the feet of masters like Bardeen or Shannon. Most importantly, you were free to pursue any idea or research project that you wanted, free to ask anyone for advice, free to be led where the evidence pointed. Of course this extraordinary freedom was made possible by the immense profits generated by the monopolistic AT&T, but the heart of the matter is that Bell's founders recognized the importance of focusing on long-term goals rather than short-term profits. They did this by gathering bright minds under one roof and giving them the freedom and time to pursue their ideas. And as history makes clear, this policy led not only to fundamental discoveries but to practical inventions greatly benefiting humanity. Perhaps some of today's profitable companies like Google can lift a page from AT&T and channel more of their profits into basic, broadly defined, curiosity-driven research. Gertner's highly readable book leaves us with a key message. As America struggles to stay competitive in science and technology, Bell Labs still provides the best example of what productive industrial research can accomplish. There are many lessons that modern organizations can learn from it. One interesting lesson arising from the cohabitation of research and manufacturing under the same roof is that it might not be healthy beyond a point to isolate one from the other, a caveat that bears directly on current offshoring policies. It is important to have people involved in all aspects of R&D talking to each other. But the greatest message of all from the story of this remarkable institution is simple and should not be lost in this era of short-term profits, layoffs and declining investment in fundamental research: the best way to generate ideas still is to hire the best minds, put them all in one place and give them the freedom, time and money to explore, think and innovate. You will be surprised how much long-term benefit you get from that policy. As they say, mighty trees from little acorns grow, and it's imperative to nurture those little seeds. Ahh- very nice review of a book about Bell Labs. I'll have to go check it out myself. By the way- how did you enable the tweet and facebook links at the end of your post?